PHOTO: Iberostar Grand Hotel Bavaro is part of the company’s Grand Collection group of properties, characterized by exclusivity. Caribbean destinations are sometimes thought of as more and more of the same thing. But that perception couldn’t be less true. Certainly the islands have several characteristics in common, namely the sunny skies, brilliant blue waters, white-sand beaches and lush landscapes that have attracted visitors for centuries. But each Caribbean island truly offers a unique experience with the history, culture, cuisine and even physical characteristics of each destination as random as numbers on a roulette wheel. Where Jamaica offers mountain peaks, waterfalls and rainforest regions, Curaçao is flat, rocky and somewhat barren, with intimate coves, massive cliffs and long sandy stretches. Travelers to the Dominican Republic will find Cuidad Colonial, a magnificently preserved UNESCO World Heritage Site featuring 16th-century buildings and the Western Hemisphere’s oldest paved street, dating to 1502. The Beracha Veshalom Vegmiluth Hasidim, more commonly known as the St. Thomas Synagogue in the city’s Charlotte Amalie district, dates back to 1833 and is the second-oldest synagogue and longest in continuous use in an American territory. Fittingly, Caribbean destinations feature a broad collection of hotels and resorts, from value-oriented properties to intimate boutique hotels and all-inclusive resorts. The following information will serve as a handy guide for Caribbean travel retailers eager to target the islands that offer the best combination of activities and resorts for their client base. 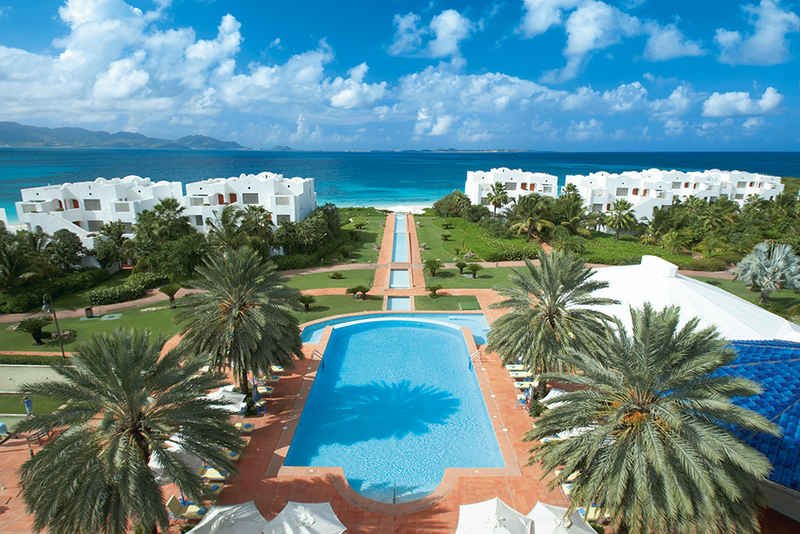 PHOTO: CuisinArt is an intimate, casually sophisticated beachfront resort. Anguilla is located 150 miles east of Puerto Rico and is the most northerly of the Eastern Caribbean’s Leeward Islands. Measuring only 16 miles by three miles, Anguilla features 12 miles of white-sand beaches bordered by tranquil blue waters. All of the island’s 33 beaches are public and most feature distinctive rock and coral formations and exotic tropical plants. Beachside bistros and bars overlook the long ribbons of sand on this easygoing but upscale island. Historic sites include the Heritage Collection Museum, which displays key documents, photographs and letters from the island’s history, along with Arawak Indian artifacts. All of the island’s beaches provide access to reefs and rock formations popular with snorkelers. The primary snorkeling spots include Crocus Bay, Shoal Bay East, Junk’s Hole and Sandy Island. Anguilla is a perfect location for upscale travelers and couples looking for romantic getaways. CuisinArt (www.cuisinartresort.com) is an intimate, casually sophisticated beachfront resort offering 97 suites and villas. The property also features several gourmet restaurants and the Venus Spa, which offers specialized aqua therapy treatments. The property is highlighted by an 18-hole Greg Norman-designed championship golf course. CuisinArt is partnering with The Met Golfer and Marchesi Antinore Wines to host the “Epicurea: Taste. Play. Smile” event from Nov. 6 to 10. The special event will feature cuisine seminars in CuisinArt’s Kitchen Stadium by four celebrity chefs: Philippe Lusseau, Christophe Muller, Alex Lee and the resort’s resident chef, Jasper Schneider. CuisinArt’s resident sommelier will also offer wine pairings at special sampling sessions. Guests will also enjoy access to CuisinArt’s 18-hole course. The packages are priced at $3,730 for two and include five chef-prepared meals; ferry transfers to and from St. Maarten, four night’s beachfront junior suite accommodations; continental breakfast; two rounds of golf and resort amenities. Visit www.epicureagolf.com for details. The Bahamas offers unrivaled natural beauty, consistently sunny skies and warm temperatures, as well as a diverse range of hotels and resorts for families, honeymooners, groups of friends and just about anyone looking for a relaxing respite along a beautiful beach. Bahamas resort properties are as varied as the 700 islands, keys and islets that compose the archipelago. There are intimate and upscale boutique properties, large and feature-filled mega-resorts and just about everything in between. A number of sites in and around the capital city of Nassau provide modern-day links to the destination’s Colonial legacy. Active vacationers eager for diving, snorkeling and other water sports will find a broad variety of options available. The Bahamas is also well suited to family vacations and destination weddings. Breezes Resort & Spa-Bahamas (www.breezes.com) is located on what many consider the best stretch of Nassau’s Cable Beach. The resort recently completed a $7 million renovation of its public areas and all 391 guestrooms and suites. Resort-wide Wi-Fi access is now offered, and the Banana Boat, a new $1.5 million restaurant offering three daily meals and a midnight buffet, has replaced the former main dining room. Dining options also include Martino’s, an Italian specialty restaurant and the poolside Reggae Café, which features fun island fare on Sunday and Monday nights. The resort accommodates families and budget vacationers seeking access to attractions and activities across Nassau and the Bahamas. 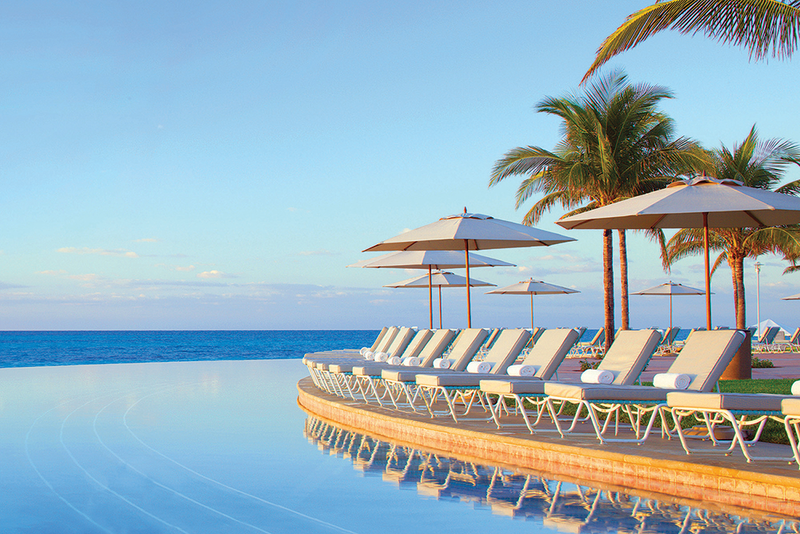 PHOTO: The infinity pool at the Grand Lucayan in the Bahamas. Grand Lucayan, Bahamas (www.grandlucayan.com) offers travelers the type of full-feature resort, set amidst beautiful natural surroundings, for which the Bahamas is famous. Located on Grand Bahama Island, Grand Lucayan features 542 guestrooms and suites along a 7.5-acre white-sand beach. 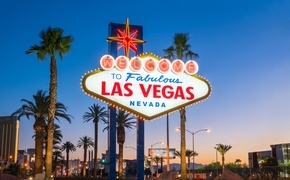 Guest facilities include three swimming pools, four tennis courts, a 25,000-square-foot spa and fitness center, a Las Vegas-style casino and multiple dining options. The resort’s fine-dining restaurant, Churchill’s, features an exclusive menu designed by Michelin-star chef Gianfranco Chiarini, an Italian nouvelle fusion cuisine specialist. Grand Lucayan’s Reef Course is an 18-hole Robert Trent Jones Jr.-designed golf course. Family vacationers, groups of friends, and travelers seeking sunny getaways will all enjoy Grand Lucayan. This sunny southern Caribbean island is located just 35 miles north of Venezuela and offers an exotic destination best known for the colorful Dutch Colonial-style row houses in the capital city of Willemstad, a UNESCO World Heritage Site. The historic capital features colonial architecture influenced by Dutch styles, as well as quaint museums and sidewalk cafés that feature Dutch and Creole cuisine. Beyond the capital Curaçao is a flat, rocky and somewhat barren island, with calm-water beaches along the sheltered southwestern coast. That region is also home to intimate coves, massive cliffs and long sandy stretches. With deep blue waters surrounding the island, Curaçao offers many opportunities for water sports, snorkeling and diving excursions to sites, including Porto Mari’s double coral reef. Boca Tabla is a popular underwater cave and dive site. Curaçao also features eight historic forts, some of which have been redeveloped as hotels and restaurants. With its strong links to African and European cultures, Curaçao offers an exotic experience ideal for upscale, frequent travelers. Sunscape Resort Spa & Casino (www.sunscaperesorts.com/curacao) is an upscale, all-inclusive property serving families and groups of friends with premium accommodations among lush Caribbean fauna. The resort’s “Unlimited Fun” policy provides guests with exclusive amenities and services including an Explorer’s Club for children. Accommodations feature cozy suites with beachfront views and guest facilities include a therapeutic spa. The Dominican Republic has experienced explosive visitor arrival growth over the past few years. The country’s fast-increasing popularity has been driven by North American vacationers drawn by white-sand beaches, blue waters and lush green rainforests, and a wide array of upscale, all-inclusive resorts. In fact, the Dominican Republic likely features more all-inclusive properties than perhaps any other Caribbean destination. Yet the Dominican Republic is also a surprisingly diverse destination, with attractions that include Santo Domingo’s Zona Colonial district, a UNESCO World Heritage Site. Many of the country’s all-inclusive resorts are located in the Punta Cana district on the Dominican Republic’s east coast. But travelers will also find charming, smaller scale resort towns such as Cabarete, Las Terrenas, and Sosua , which feature intimate and upscale resorts set along secluded beaches. The destination is suited to almost any type of vacationer, but is well positioned to accommodate families, romantic couples and value travelers seeking activity-filled getaways. The Breathless Punta Cana Resort & Spa (www.breathlessresorts.com/punta-cana) is a750-room, adults-only resort for “sophisticated” couples, singles and groups of friends. The trendy property’s upscale amenities and services include free Wi-Fi access plus day and nighttime activities and entertainment frequently featuring celebrity hosts and performers. Guestrooms and suites offer ocean views and private terraces, daily refreshed mini-bars, and 24-hour room service and concierge services. Breathless Punta Cana also offers 13 dining options and seven bars and lounges, plus spa and fitness facilities. Wedding services and honeymoon packages will also be available. 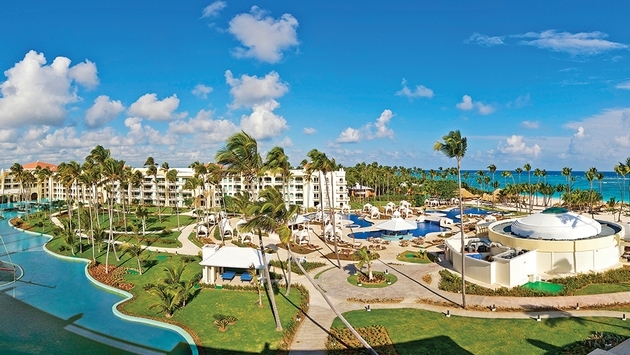 The Hard Rock Hotel & Casino Punta Cana is billed as the country’s first all-inclusive luxury property and is a sweeping, upscale property featuring one of the Caribbean’s largest casinos. Located along a broad white-sand beach, the property includes an 18-hole Nicklaus-designed golf course, an expansive spa and 11 pools with four swim-up bars. The resort also features several nightclubs, specialty restaurants and bars, exclusive retail outlets and a kid’s club and children’s activities program. Classic rock memorabilia is displayed throughout the resort, and high rollers can check into the luxuriously decadent Rock Star suite. The Hard Rock is suited for family vacations, romantic escapes, weddings and getaways with friends. The adults-only Iberostar Grand Hotel Bavaro (www.iberostar.com) is part of the company’s Grand Collection group of properties, characterized by exclusivity, style and spectacular settings. These five-star properties feature exquisite contemporary décor, gourmet dining, 24-hour concierge and butler services, along with 24-hour room service; plus numerous amenities such as spa services and world-class golf. Jamaica’s consistently warm weather and lush natural environment, combined with the island’s distinctive music, cuisine and culture, make the country one of the most popular Caribbean destinations among North Americans. The friendly, relaxed attitude of Jamaica’s people is a time-honored aspect of travel to the country. Jamaica also offers some of the world’s most attractive beaches and a natural environment that includes an array of waterfalls, mountains and rainforests. Jamaica’s hotel and resort properties are equally wide-ranging, from small boutique properties to five-star luxury resorts and everything in between. Jamaica is a travel sellers’ dream because it offers something for everyone, from high-income empty nesters seeking top-shelf accommodations and travel experiences, families in search of value-oriented vacations, newlyweds and adventure-seekers, to clients who simply want to enjoy a relaxing vacation with plenty of daytime sun-worshipping and nighttime revelry. The Jewel Runaway Bay Beach & Golf Resort (www.jewelresorts.com) is an all-inclusive resort for all ages located in Jamaica’s picturesque Runaway Bay district. The resort offers multiple dining options, an 18-hole championship golf course and accommodations, including guestrooms with plunge pools and concierge services. The resort will open a new $5 million water park in March of 2015. The oceanfront property also offers the full-service Radiant Spa and Bling! a chic new nightclub. Ocho Rios’ Couples Tower Isle (www.couples.com/tower-isle) is an all-inclusive boutique resort featuring sweeping water views along a private white-sand beach. Public areas feature chic contemporary décor with murals and ceramics by renowned artists mixed with black-and white photographic art prints and tiled accents. The resort’s 218 rooms and suites offer plush king-size beds and open onto furnished, private balconies and patios with outdoor tables and seating. The resort also features six restaurants and four bars. Guests can relax in one of the property’s four Jacuzzis or any of four pools, and Couples Tower Isle even features its own “au naturel” private island. Guests can enjoy snorkeling and windsurfing excursions along with tennis and golf. The resort’s $1 million kitchen and organic herb gardens provide produce for the resort’s farm-to-table cuisine. Complimentary excursions are available to Dunn’s River Falls and Margaritaville, plus activities, including glass-bottom boat, scuba and catamaran excursions. The 308-room Sunset Beach Resort, Spa & Waterpark (www.sunsetresortsjamaica.com) in Montego Bay offers a full-feature property for singles, couples and families. The beachside resort features a wide range of fun-in-the-sun activities and amenities for vacation and business travelers. The resort also features a full-service spa offering a variety of treatments, and guests can select from a full menu of land and water activities, including motorized water sports. Another highlight it the protected marine sanctuary located just yards off the property’s beach. Guests can discover the marine sanctuary on their own or explore the area via a guided tour. Saint Maarten is the Dutch side of an island split between French Guadeloupe and the Dutch Netherlands Antilles, located in the Caribbean’s Leeward Islands. Philipsburg is the capital of the Dutch side, and while the island is controlled by two different countries, there is no real border aside from a handful of monuments and signs that delineate it. With hundreds of duty-free shops, an eclectic array of restaurants, casinos and loads of water sports, St. Maarten is a favorite among action-oriented vacationers. It has 37 white-sand beaches. Cupecoy Bay Beach near the Dutch-French border is dotted with caves and cliffs. Maho Bay Beach, located near the Princess Juiliana International Airport, has become an attraction for tourists who watch planes take off and land just above the beach. The Sonesta Maho Beach Resort & Casino (www.sonesta.com/mahobeach) is an iconic all-inclusive property accommodating families, couples and groups of friends enjoying active getaways. The resort features a large pool with cascading waterfalls, four tennis courts, a children’s program, a swim-up pool bar, five restaurants and bars, a casino and a nightclub. The property attracts and accommodates families with children, destination wedding travelers, groups and active vacationers seeking diving, snorkeling and water sports activities. The U.S. Virgin Islands is a close-to-home paradise especially for U.S. travelers, who will appreciate the destination’s proximity and strong air links to major cities, especially on the East Coast. Not to mention that, because the Caribbean archipelago is actually a U.S. territory, Americans may travel there without a passport. That’s not to say the destination is without curb appeal. The U.S. Virgin Islands are easily among the Caribbean’s most beautiful regions, with volcanic and hilly St. Thomas offering 40 mostly spectacular beaches, highlighted by Magens Bay, consistently rated among the top 10 beaches in the world. Virgin Islands National Park has miles of shoreline beaches and footpaths. St. Thomas is one of the Caribbean’s best shopping cities with a wealth of duty-free complexes, stores, shops and outlets. St. Croix is the territory’s largest island, known for its Buck Island Underwater National Park, with marine gardens and reefs. Accommodations feature barefoot-casual beach inns and five-star resorts, along with a collection of alternative lifestyle hotels. St. John is the smallest of the territory’s three major islands and features a national ecological park, with dense tropical forest trails; the Trunk Bay preserve features underwater trails. AMResorts assumed operations of the 294-room Sugar Bay Resort & Spa (www.sugarbayresortandspa.com) on July 1. The property will undergo extensive renovations, which will entail upgrades to all guest accommodations, including 100 new Preferred Club–level rooms. The resort will be rebranded as the Dreams Sugar Bay St. Thomas Resort & Spa in November. The beachside property will offer sweeping views of the Caribbean Sea as well as the brand’s “Unlimited Luxury” all-inclusive policy featuring premium accommodations, 24-hour room and concierge services, a dedicated Explorer’s Club for Kids, gourmet dining and a beverage program, plus daily entertainment. The Marriott Frenchman’s Reef Hotel (www.marriottfrenchmansreef.com) is an iconic St. Thomas property well suited to families and destination wedding couples, as well as busy professionals seeking a quick getaway. Accommodations in the main building’s 290 guestrooms feature contemporary Caribbean décor, and the property also boasts an expansive pool deck, the Lazule Sea Spa, a fitness center and seven separate dining venues. Other facilities include a children’s pool and Splash Zone, and an adults-only infinity pool. The resort’s 186-room Morning Star Beach Resort wing features beachfront cottages located steps away from Morning Star Beach, with views of the Caribbean Sea.